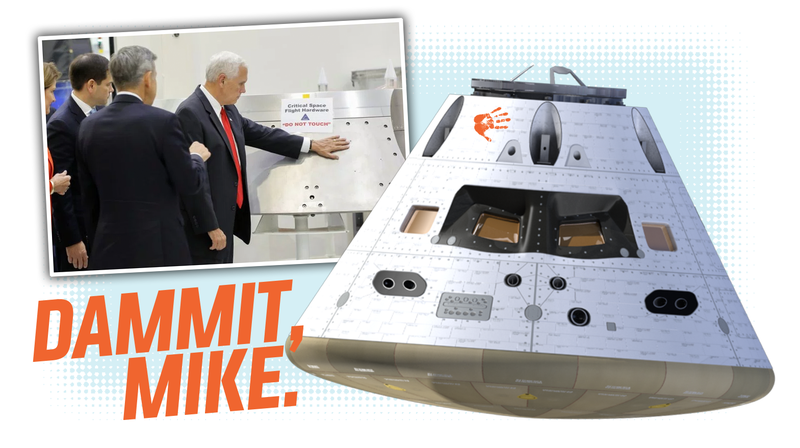 Yesterday, the big joke involved a picture of U.S. Vice President Mike Pence at NASA’s Kennedy Space Center, full-palm touching an Orion spacecraft part that was clearly labeled “DO NOT TOUCH.” It’s a hilarious image, but what exactly is that untouchable thing, and what does it mean that Pence pawed it? I am here with answers. So, let’s take a good look at that picture; the part Pence is touching, scant inches below the big red letters that tell him not to do precisely what he’s doing, has a pretty distinctive shape, with a dramatic recessed area scalloped out of it, an upper section that appears to be a segment of a larger ring, and an overall shape suggesting it’s part of a conic-section-shaped area. Looking at diagrams of the Orion crew capsule, we can see that this part is a piece of the assembly known as the Forward Bay Cover. The Forward Bay Cover makes up the upper portion of the truncated-cone shape of the capsule, and is the protective cover over equipment used post atmospheric re-entry, most notably the large parachutes used to slow the craft’s descent. The Forward Bay Cover is used to protect the equipment installed atop the forward bulkhead of the Orion Crew Module which offers a large volume for the installation of external hardware around the Crew Tunnel of the spacecraft. FBC is 2.6 meters in diameter and weighs 205 Kilograms. The cover consists to six composite face sheets with titanium honeycomb cores covered with TUFI-coated AETB-8 tiles (Toughed Uni-Piece Fibrous Insulation alumina-fiber-enhanced-thermal-barrier tiles). It protects the equipment installed underneath from the extreme temperatures during space flight and the heating environment during re-entry. So, the part that the VP laid his soft, moist hand on would have been the titanium outer sheet, which will have the thermal protection tiles bonded to it. Pence’s hand oils, dirt, dust, and taquito crumbs or maybe Werther’s Originals fragments could cause issues with the bonding of these thermal tiles to the aluminum skin. Of course, that would only be the case if NASA was going to bond those tiles on right then, which, of course, they’re not. NASA’s not stupid. You don’t put important hardware in front of any politician and not expect some mishandling. “The ‘do not touch’ signs are there as a day-to-day reminder, including the one visible on the titanium Forward Bay Cover for the Orion spacecraft. Everything’s going to be fine. Some NASA tech will probably have to spend a little more time scrubbing the area right under the DO NOT TOUCH sign, but that’s about it. No harm done. Even so, it is still pretty ridiculous that he’d do this at all, and perhaps NASA should be investing in some NO VICE PRESIDENTS PERMITTED signs for the spacecraft assembly facilities. Then again, maybe not. It’s not like the dude reads signs, anyway.